ABUNDIUS, a parish priest in a village near Cordoba during the Moorish occupation. St. Abundius, one of the Martyrs of Cordoba, was arrested for preaching against Islam, and brought before the Emir. He was sentenced to death by beheading for refusing to renounce Christ. After the sentence was carried out, his body was thrown to dogs, and no relics survived. AMABILIS, an English noblewoman who was a monastic at the Abbey of St. Amand in Rouen. The traditional feast day for St. Benedict is 21st March in the West and 14th March in the East. In 1969, the Roman Catholic church moved the Feast from 21st March (date of his repose) to 11th July (translation of his relics), and some Western Rite Orthodox calendars show 11th July as the feast day. The only authoritative life of St. Benedict extant is by St. Gregory the Dialogist (3rd September) in the second book of his Dialogues , and this is more of an outline of important episodes in St. Benedict’s life, than a proper vita. According to tradition St. Benedict and his sister St. Scholastica (10th February) were twin children of a Roman noble, born in Nursia, near Spoleto. When St. Benedict was most likely in his early twenties, he left behind secular concerns to devote himself to God, and went to live as a hermit in a cave near Subiaco. There he was a spiritual child of the near-by hermit, St. Romanus of Subiaco (22nd May), who also tonsured him into monasticism. In time, his holiness and fame as a wonderworker, drew many disciples to him and he built a lavra, for them. Around 530 he left Subiaco for Monte Cassino, where he founded the famous monastery, where he also composed his Rule, which, though initially was resisted by many as too harsh, came to be adopted by tens of thousands of monasteries the world over. St. Benedict spent the rest of his life at Monte Cassino. St. Benedict reposed while standing in prayer before the altar in 550. St. Benedict was buried at Monte Cassino, though some of his relics were later translated to France. DROSTAN, According to the Aberdeen Breviary , St. Drostan was a disciple of St. Columba (9th June) who left his native Ireland for Scotland. There he founded and served as the first Abbot of Deer in Aberdeenshire. He is counted amongst the Apostles of Scotland. St. Drostan reposed circa 610. HIDULF (HIDULPHUS), the founding-Abbot of what came to be called the Abbey of Saint-Hydulphe de Moyenmoutier. Historically he has been listed as a Bishop of Trier, and an Abbot of Saint-Dié in eastern France, however, recent scholarship questions this. St. Hidulf reposed in 707. JOHN of BERGAMO, consecrated Bishop of Bergamo circa 656, St. John managed to root out the last vestiges of Arianism from his See. Unfortunately his success came at a great price, as he was martyred by supporters of Arianism in 681. LEONTIUS the YOUNGER, a soldier who fought the Visigoths. 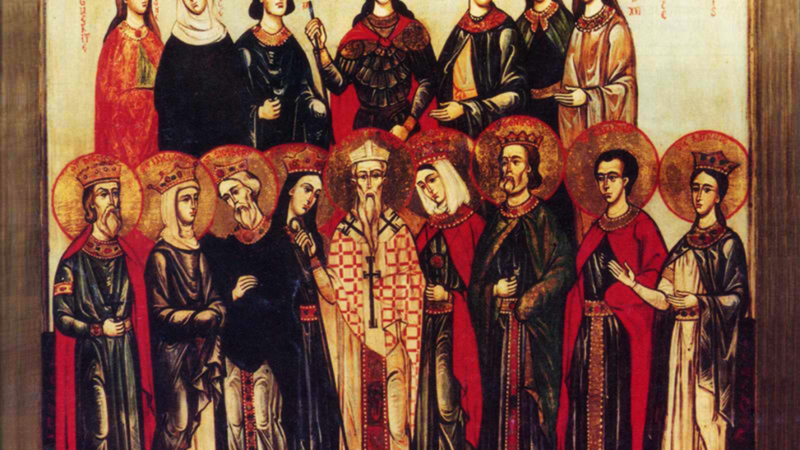 After retiring from the army, St. Leontius married and settled in Bordeaux. He later served as Bishop of Bordeaux. St. Leontius reposed in 565. PIUS I, the tenth Pope of Rome from circa 142 until his repose circa 155. We know he was an opponent of Marcion and his Teachings. He is generally called a martyr, and while it is possible St. Pius was martyred, there is no evidence to support this. SABINUS (SAVINUS) and CYPRIAN, (Date Unknown), two brothers venerated in Brescia as martyrs. The extant Acts are of questionable veracity. SABINUS of POITIERS, (Fifth Century), a disciple of St. Germanus of Auxerre (31st July). There are no reliable Acts extant, but according to local tradition St. Sabinus was a martyr. SIDRONIUS, a martyr in Rome circa 270. No further information is extant. SIGISBERT and PLACID, St. Sigisbert was the founder of the monastery of Disentis in the present-day Swiss canton of Grison. He built it on land given to him by St. Placid, a local noble and landowner who later received monastic tonsure at the abbey. St. Placid was martyred for defending the abbey’s rights. Traditionally this was thought to have happened in the seventh century. However, more recent scholarship, supported by archaeological evidence places it a century or so later. THURKETYL (TURKETIL), the brother of King Edred of England and served as his chancellor until 948 when he abandoned court life and received monastic tonsure. St. Thurketyl restored Crowland Abbey, which had been sacked by the Danes, and served as its abbot. St. Thurketyl reposed 975.